Russian offshore oil rig. 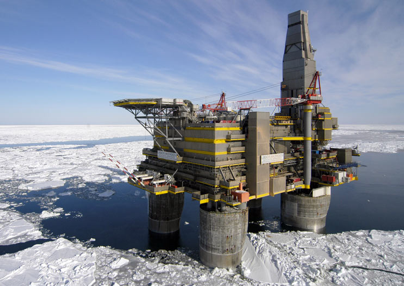 Climate change is making the Arctic more accessible to oil exploration. Cisoilgas.com. Climate change may be set to adversely affect hundreds of millions of people, but there are some who see it as a potential boon in the northernmost extremity of the planet. Commercial shipping sees the melting ice as a way to save travel time- up to 25%- between Rotterdam and Korea, avoiding the lengthy route through the Suez Canal and passing instead above Russia- known as the Northeastern Passage. It has only been in recent years that ships have been able to do this, given the receding of Arctic ice. It has also relied upon Russian bureaucracy’s willingness to facilitate transport, by allowing ships in its Arctic ports and by providing ice-breakers. Notwithstanding this, there is a treasure trove of untapped resources hidden beneath the Arctic Ocean waiting to be claimed. According to the United States Geological Survey, around a quarter of the world’s undiscovered oil and gas reserves lay there. Determining who actually owns the ground to be explored is a fastidious task. The UN Commission on the Limits of the Continental Shelf (UNCLOS) allows a ten-year period for nations to stake territorial claims, based on the territorial limits of a continental shelf. Russia is set to claim up to 380,000 square miles of the internationally owned Arctic in the next year, arguing that the Lomosonov ridge is an extension of Siberia. Whatever the Commission decides- and it is reasonable to assume that Russia has a legitimate claim to the lion’s share of territory given it’s geographical dominance in the region vis-à-vis smaller nations such as Norway- the biggest problem is that Russia’s most powerful rival in the region, the US, hasn’t yet ratified UNCLOS. Perhaps this US intransigence can explain Russia’s brash move in 2007, sending a scientific vessel under the Arctic Ocean and planting the Russian flag underneath the North Pole. This symbolic act failed to attract the kind of attention that such a gesture sought. Policymakers may have tactically downplayed this, or simply been preoccupied with more pressing concerns of the recent financial crises- but they cannot ignore this sensitive region for much longer. A renewed confidence from President-elect Vladimir Putin may well translate into the kinds of geopolitical recalcitrance that has long irritated the West. Concern may be behind Putin’s confidence. Promises to increase social spending by $170 billion may make exploration in the Arctic paramount in Russia’s future foreign policy. Unlike areas such as Eastern Europe and Central Asia, the Kremlin sees the Arctic as a region which hasn’t already succumbed to NATO’s influence. Profit and pride will combine to ensure that Russia will defiantly defend its interests there. Putin already made clear that the Russian Navy needed to be ‘capable of service in the Arctic Ocean’. For policymakers, this should be of concern, especially given Putin’s lack of consistency with foreign businesses. BP may be overjoyed at a joint venture with Rosneft in the region, but it should also remember that back in 2007 Gazprom bought up its gas fields in Siberia, paying such a low price that it was considered to be ‘bordering on nationalisation’. A pressurised Putin may find such an option to be a good way of increasing state revenues. British businesses may find their situation becomes more precarious as more wealth is found in the region. Press TV. The UK doesn’t need a worsening of UK-Russia relations. 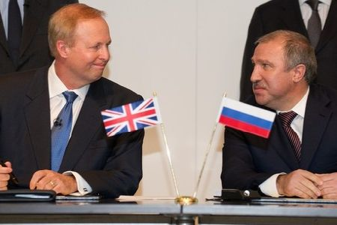 At best they have been tense, and this certainly wouldn’t be ameliorated if British businesses like BP were to be unsure of their long-term presence in Russia. Yet unless clear national boundaries are decided in the Arctic, this uncertainty cannot be expected to diminish. Britain may not be an Arctic nation, but it still has an interest to reduce tension amongst them. Trying to persuade the US to ratify UNCLOS, and therefore establishing clear rules of what territory can be claimed, would be a good starting point for future negotiations. The latency of the Arctic as a geopolitical hotspot is quite clear, and Russia has already made some clear indications of its interest in the region. An aggressive approach by the United States would provide the sort of threat Putin’s rhetoric thrives on and would be counterproductive for all nations involved. The only certainty for policymakers is that since Putin isn’t leaving anytime soon, the West will need to tread carefully over the ever-thinning ice.